There’s good food everywhere. But in Perú, it’s easier to find. Because of 28 different micro climates, food options are abundant. I spent the majority of my time on the coast, where fish and seafood is copious and cheap. 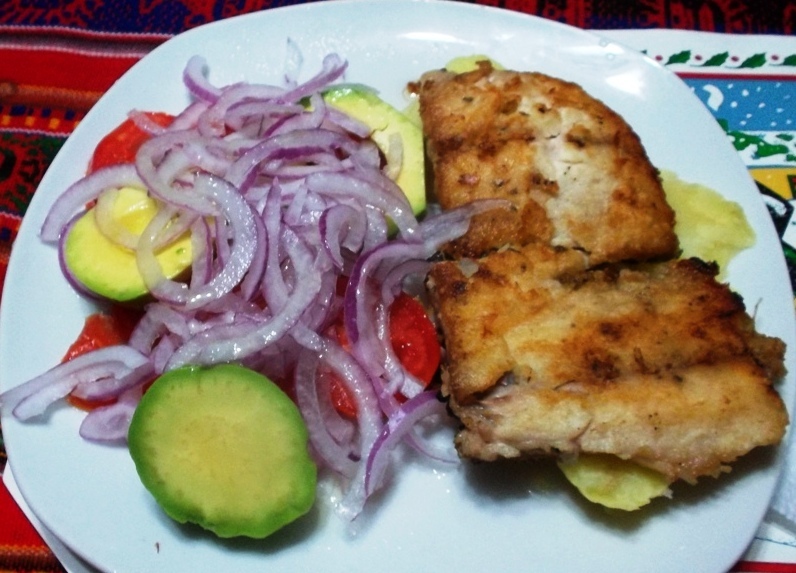 Perú’s rich Pacific coastline is home to some of the tastiest fish and seafood on the planet. I must note also that I was trying to keep a budget in check. I wasn’t going out of my way to spend a lot. 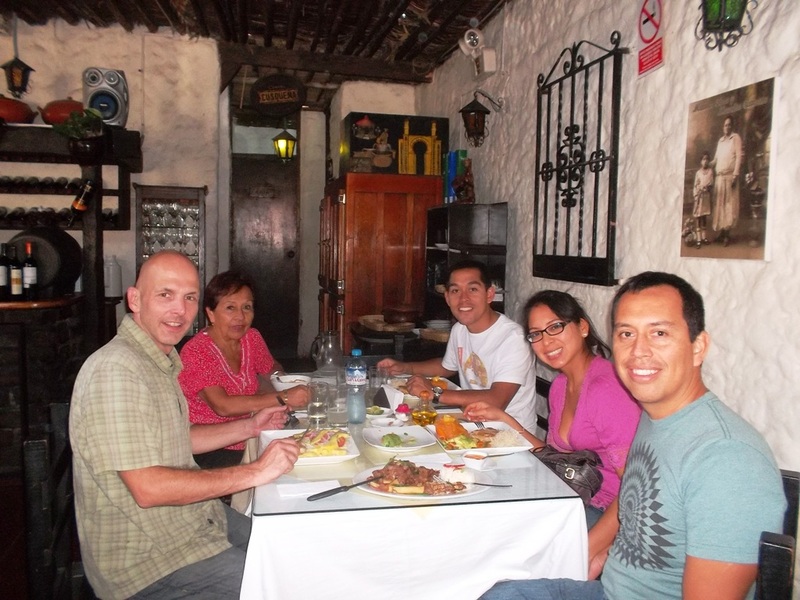 There were occasions, like in Lima with my friend, that I dined in nice places. I’ve mentioned in past posts that I’m a semi vegetarian. You’ll see that I cheated a bit in Perú. Because I grew up on fish and seafood, I can’t imagine giving that up. Like a vegetarian or vegan, I often want to say the above. However, from a personal etiquette standpoint, if someone serves me something, I can’t break their heart and turn it down. This is especially true when I’m in a home in a foreign land, and the new friends are genuinely trying to share their culture with me. ● If I’m in a bind and the only thing available is meat, I consume it. For example, recently in Arequipa, it was 11 pm when I realized that if I didn’t get something to eat, I was going to wake up hungry. There were no restaurants open near my hotel. The only food I could find was street chicken sandwiches for 3 soles or $1. 12. I didn’t enjoy biting into the stringy, fleshy sustenance. For this reason, I spat some of it out towards a couple of stray dogs that were hanging out. Even though I still consume chicken and turkey flesh on occasion, and beef very seldom, it’s becoming more and more putrid to me. I love to eat, so I’ll probably never be able to cut out meat completely, especially while drifting and not always being able to prep my own food. ● If there’s a popular culinary dish from a land, and it has meat or chicken, I may order it just to try it once. 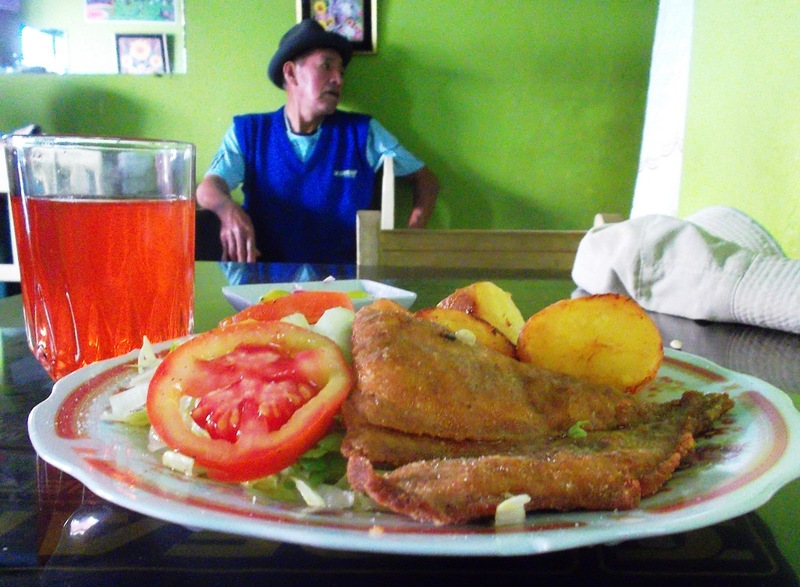 NOTE: This is in no way a definitive guide to the Peruvian food culture. This post is merely to show you some of the fun things that I was fortunate to consume during my time in the land of past civilizations, where the ancient and contemporary collide, and where most things I ate were interesting and new to my palate. Don’t forget to click on the image if you’d like a grander view. 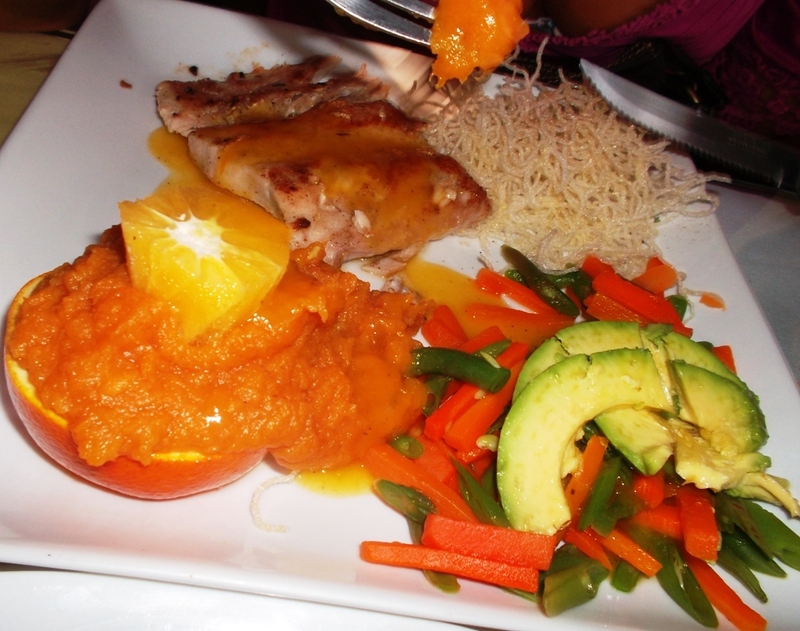 A dish like this is surely what the food crazed zealots are ranting and raving about. Left to right, mashed potatoes with a quinoa stuffing in the middle, camote, or Peruvian sweet potato, a slab of lettuce for presentation, choclo, or corn with huge kernels and ceviche topped with aji, or a Peruvian spicy pepper. To me, the spice factor is somewhere between a habanero and jalapeño pepper. This dish tasted as good as it looks. It’s from Huancahuasi in Lima and cost 32 soles or $11.93. This exotic fish dish comes with extra-sweet mashed camote, or sweet potato, served over an orange. 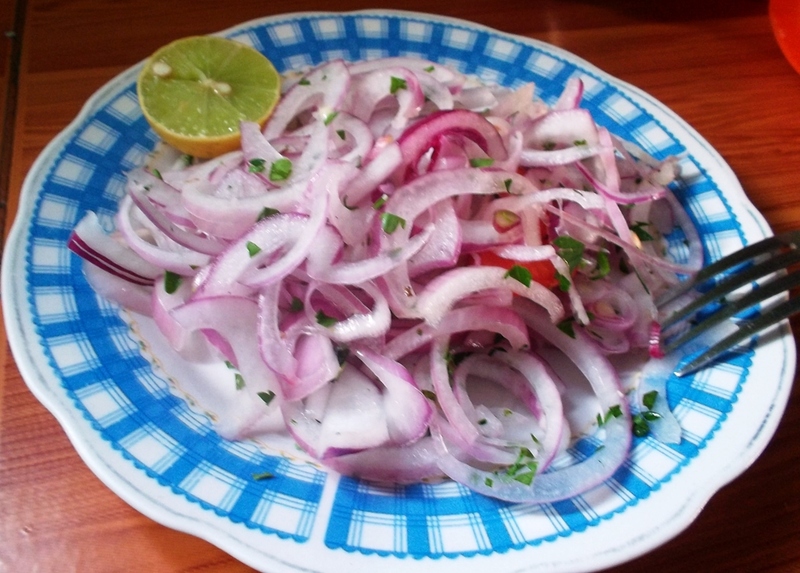 It’s from El Meson de Surco in Lima and costs 28 soles, or $10.44. 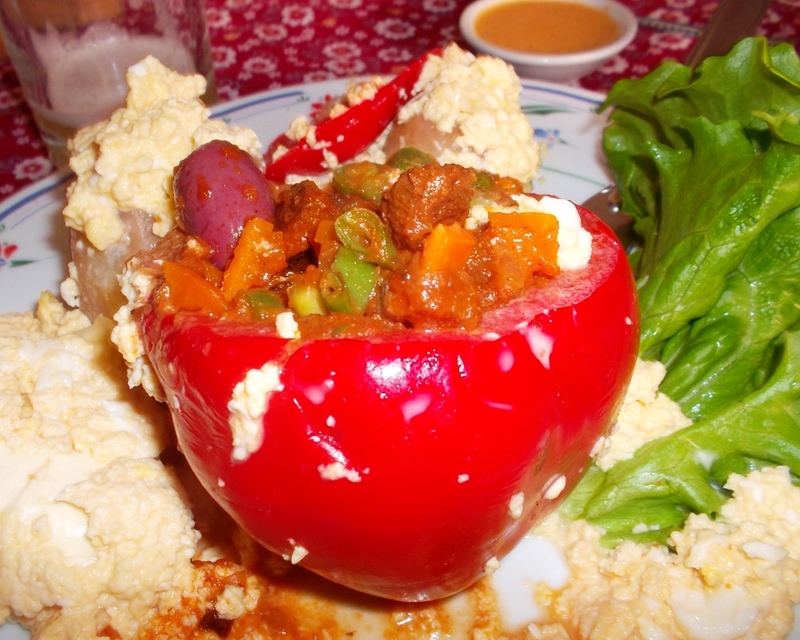 This famous dish from Arequipa is called Rocoto Relleno. 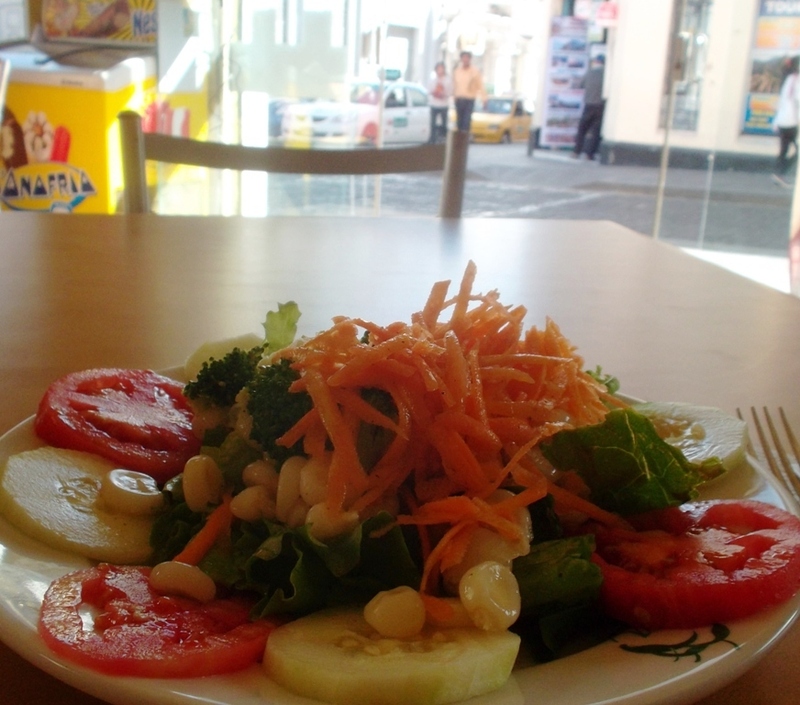 This one is from Mandala, a vegetarian restaurant on Calle Jerusalen 207 in Arequipa. It cost 15 soles or $5.60. What’s disguised as meat is really soy. This dish is loaded with aji and was too spicy for even me. It caused me to sweat, burn, and turn red. I only know a few people who like their food as spicy or spicier than I do. So be careful with this one. YES! Spicy aji is adored in Perú. It’s common knowledge that Mexican and South Korean fare can be spicy. But Peruvian, who knew? 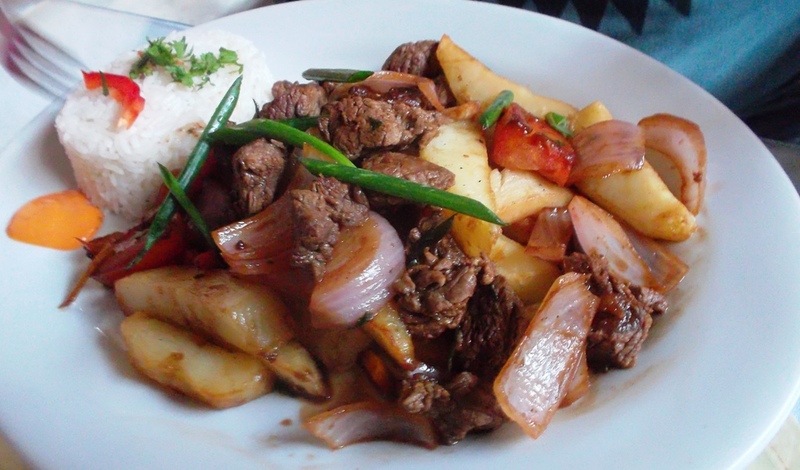 This very typical Peruvian dish is called Lomo Saltado. You see that the lomo or steak is stir fried with potato and veggies. When the name Lomo Saltado pops into my head I think: There’s a hint of Asia in Perú. 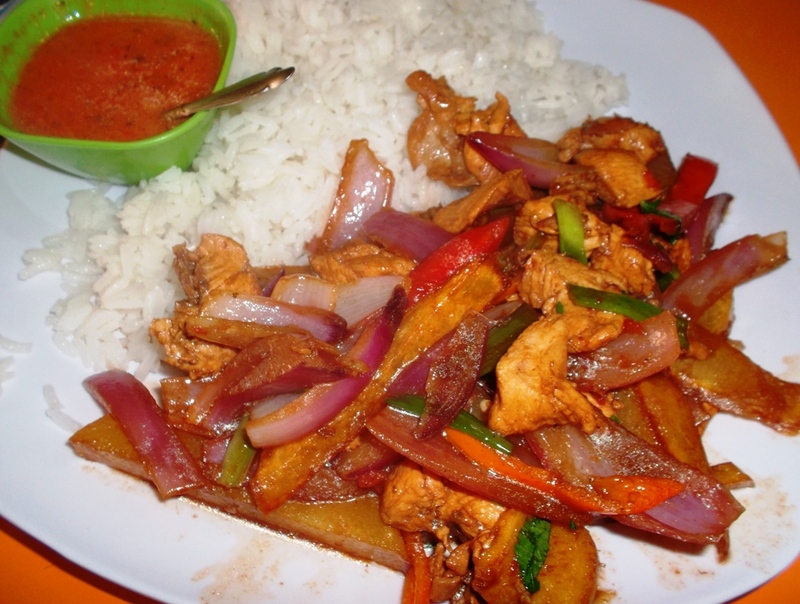 Here we have Pollo or chicken Saltado which is a lighter version of the orignal Lomo Saltado above. I love the array of colors. It was as tasty as it looks. On the side you see a small bowl of very spicy aji. If there’s none on the table just ask. This salsa is ubiquitous to most lunch and dinner tables throughout the land. 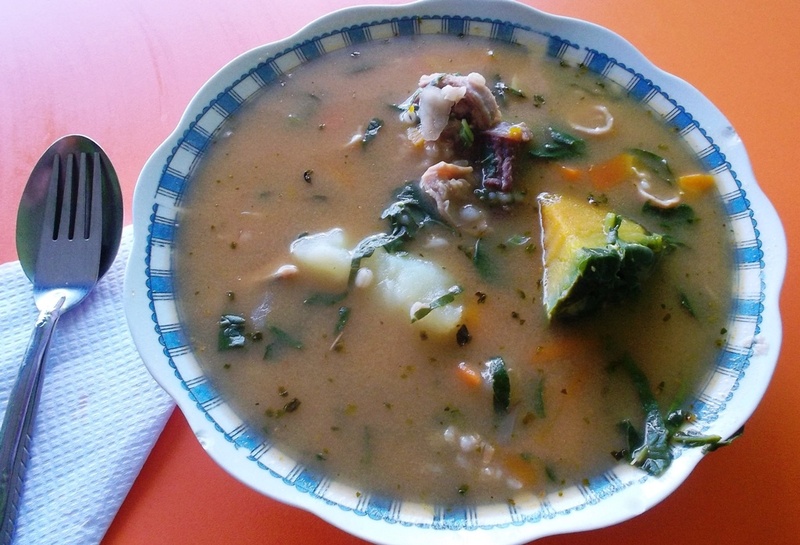 Soup is a staple food in Perú. A sopa almost always comes with your set almuerzo or lunch. Here you see a hunk of camote, or sweet potato. There’s also potato and yuca. This is a great way to get your complex starches. There are also veggies and mystery organs/meat which I just let sit. The flavor fusion in these soups packs a wonderfully warming punch to your palate. I’d often walk into places that advertised meat or chicken. As salads weren’t always a side item offered, I’d ask if they could give me an ensalada. I did this almost daily. Nine times out of 10 I was told to have a seat. The following salads cost between 2 and 4 soles or $.75 and $1.50. I never asked for the price beforehand and no one ever tried to rip me off. 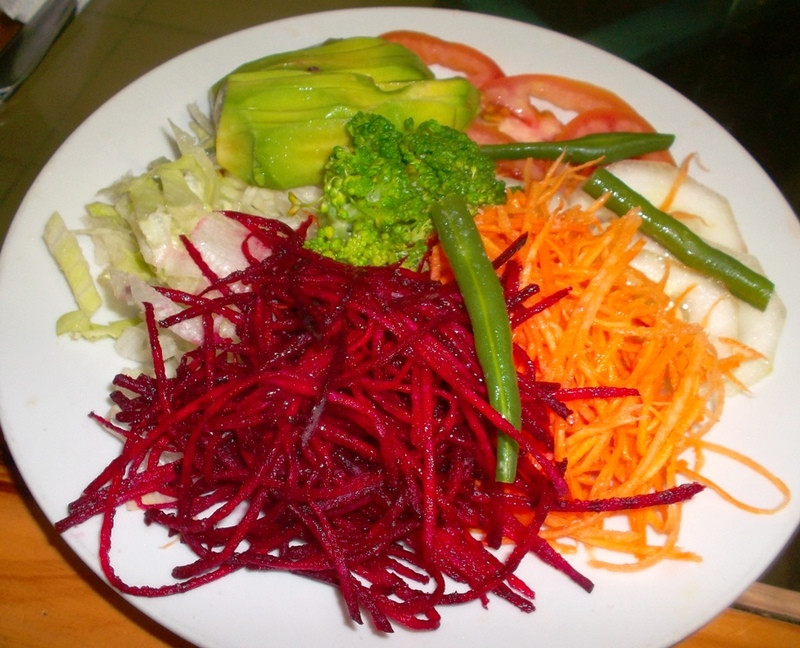 The following salad was actually on the menu at Mandalay in Arequipa, where I ate on a handful of occasions. It cost 8 soles or $2.98. 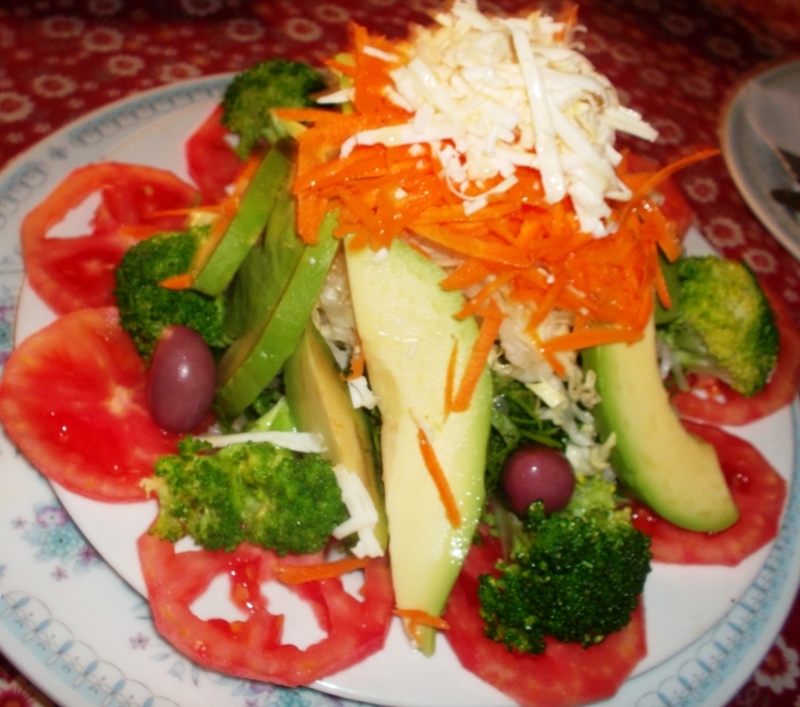 To me, this grand ensalada is a work of beauty. This one’s called Papa Rellena. I didn’t know what was inside until I cut it open. The meat inside was cooked to absolute perfection. 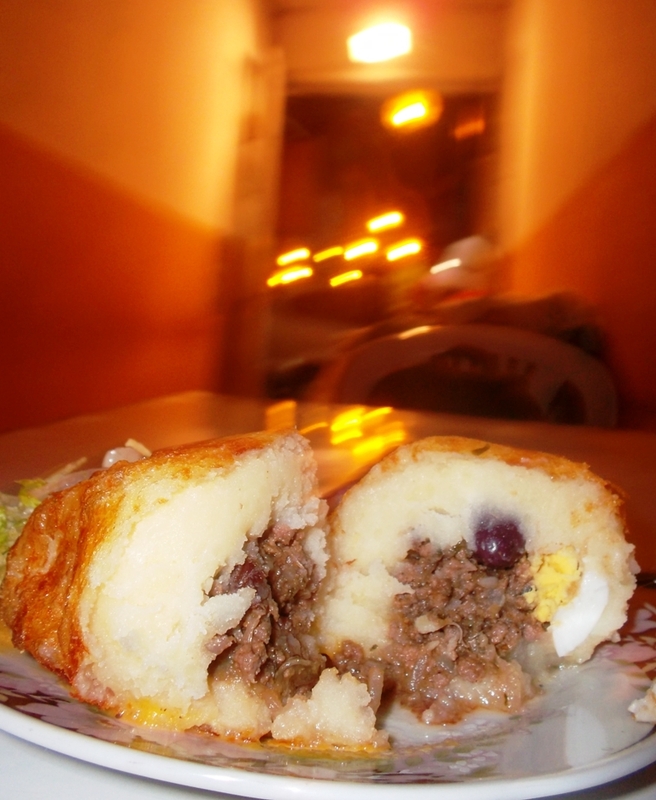 You also notice hard boiled egg, onion and olives stuffed inside the papa or potato. NOTE: Perú has more species of potato than any land on earth. 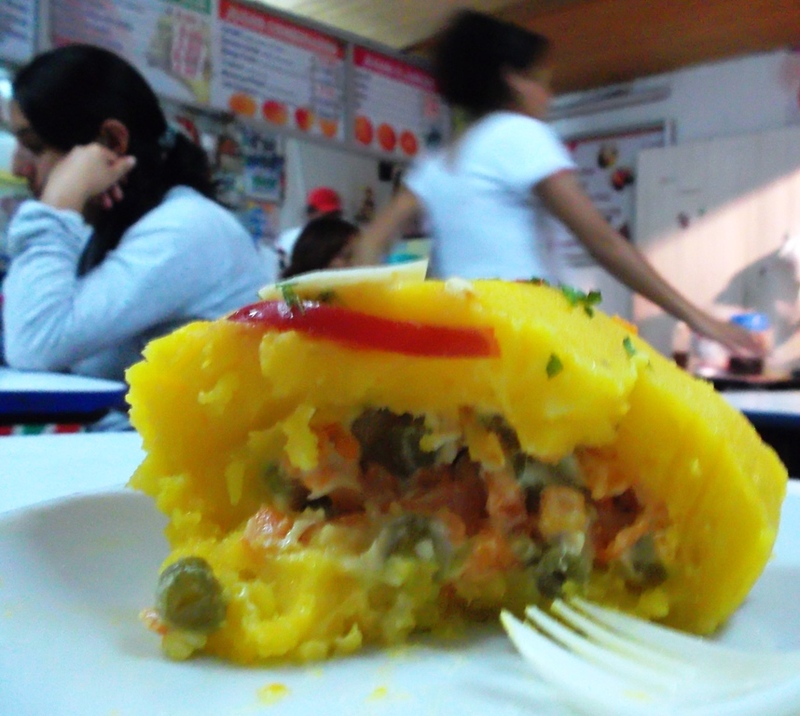 This mashed potato sensation is called a Causa. They are all over Ica and cost just 2 soles or $.75 each. It’s stuffed with a chicken veggie salad and is absolutely taste worthy. This ceviche dish from Ica cost 5 soles or $1.87. It’s served over sweet and regular potato. To the left you see canchos which are a healthy snack of dried corn and are often served complimentary before and during a meal. NOTE: Peru has more species of corn than any other land. This über-tasty concoction called picarones is deep fried with sweet potato, squash and anise. Dip them in honey, and you’ve got a taste explosion like no other. 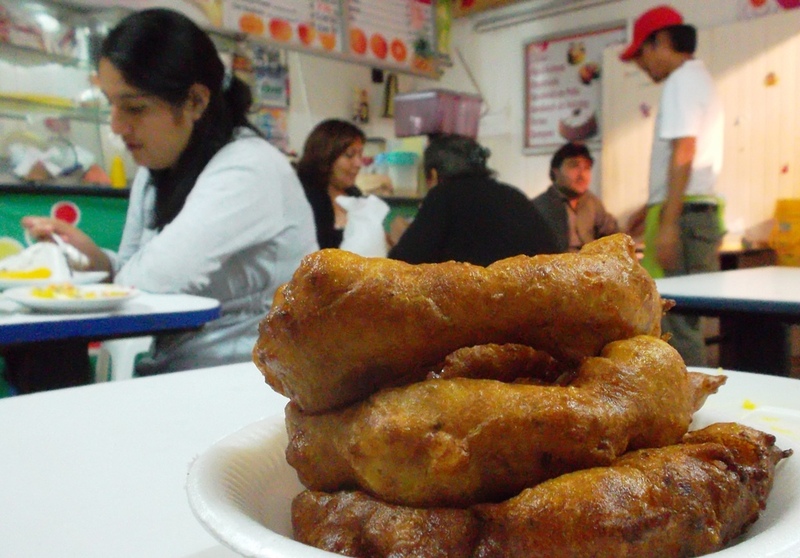 Picarones are eaten as a snack or dessert. 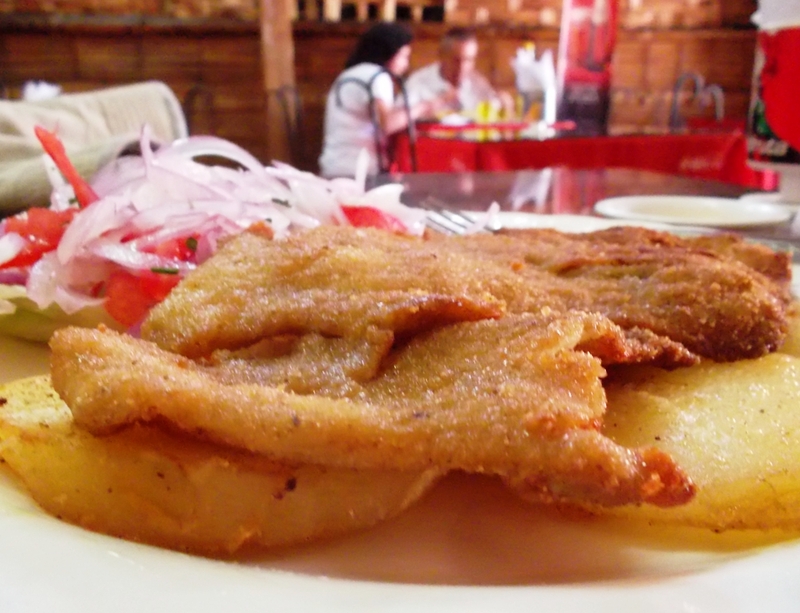 Does this post make you want to run out and find a Peruvian restaurant? 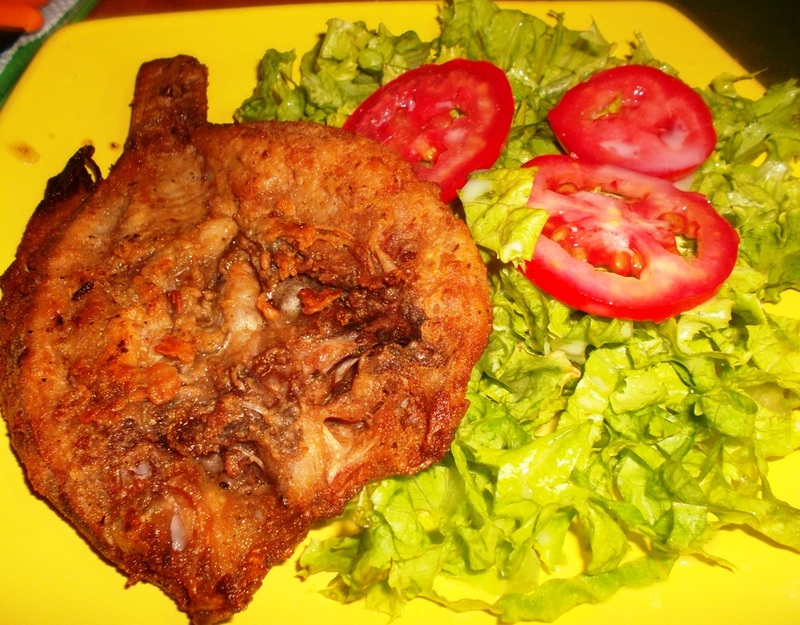 Did you know that latin cuisine can be so healthy? Feel free to leave a comment below. What nostalgia! We spent last year mostly in Asia, with its own amazing culinary delights, but your post made me yearn to be back in Peru!!! TURTLES: Peruvian has to be the best of any Latin American land I’ve been to. Of course Mexico has top notch cuisine too. I agree that most Asian countries have amazing food. in my opinion, of all the continents, Asia’s cuisine is the most dynamic. 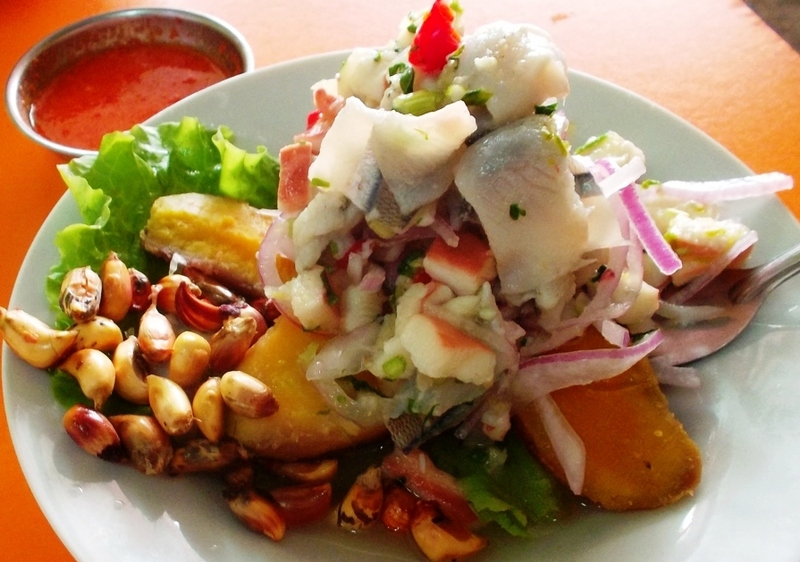 STEPHANIE: The street ceviche on the north coast was a very pleasant surprise. One vendor told me that she gets up at 2 am to get going with her ceviche that’ll be ready for breakfast. I typically eat fruit in the morning but still managed ceviche brunches fairly often. My guess is that you’ll discover endless interesting food. The Emoliente an elixir from the street seems to be everywhere and is a must! Hey Mike whats up! Looks great! I am back. DAVE: Thanks! Excellent! Hope all’s well. 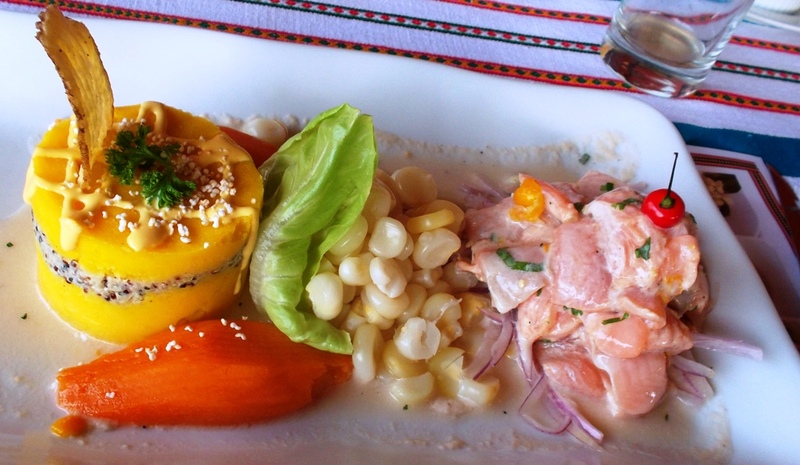 Yes, this post makes me want to immediately eat Peruvian food! I visited Peru for about 2 weeks a number of years ago and as a serious rice lover, one of the things I really enjoyed about Peruvian food is the Asian influence and abundance of rice. I also remember the pollo a la brasa, which I still think is some of the best chicken in the world! The vegetarian options also look equally amazing, I would love to go back sometime for more food and exploration! MARK: Thanks. The standard in Perú is high. I imagine there’s a great chance that you’ll make it there again to experience and report on the vast and constantly evolving food culture. You may love the street food scene too. I agree, the Asian influence there is fascinating. I tend to go through starch phases. In India it was bread, often in the form of naan. In SE Asia rice works out well as it compliments so many ultra tasty dishes there. I was obsessed with noodles when I was training to use chopsticks. Now, Perú has gotten me into potatoes. Wow, everything looks incredibly delicious. Great post! ADIRONDACKER: Thanks! Yeah, colors tend to enhance presentation, which in turn boosts flavor. Aji spices up a dish nicely too.